Ford has awarded MS-RT official Qualified Vehicle Modifier status, paving the way for the MS-RT Transit Custom sport van to be sold across Ford’s car dealer network. ﻿The MS-RT Transit Custom is a modified sport van that uses technology and aerodynamic influences from Ford’s works-backed rally team, M-Sport, to create a performance version of the country’s most popular commercial vehicle. Honest John Vans has already given the MS-RT Transit Custom the thumbs up and now the hand-modified sport van could be coming to a Ford forecourt near you, with dealers being given the green light to stock and service them. Adapted at MS-RT's Pontypool, South Wales factory, the Transit Custom’s exterior styling gets a full front bumper and grill replacement with integrated factory fog lamps, extreme front diffuser, wide body arch extensions, sills, rear diffuser and rear spoiler. Inside the van gets handcrafted MS-RT nappa leather and suede seat facings and a distinctive MS-RT sports steering wheel with carbon fibre inlays. Unlike some modified vans, the MS-RT Transit Custom is backed by Ford comprehensive three-year/100,000 mile warranty - this means owners can have servicing and work done by their local dealer. 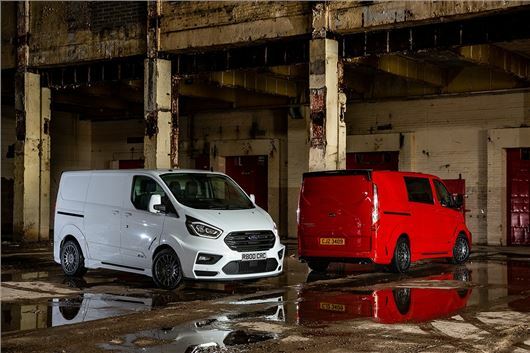 Ford will stock the MS-RT Transit Custom from early 2019 with prices for the short wheelbase panel van with a manual gearbox and 170PS 2.0 diesel engine starting in the region of £33,000 before VAT.